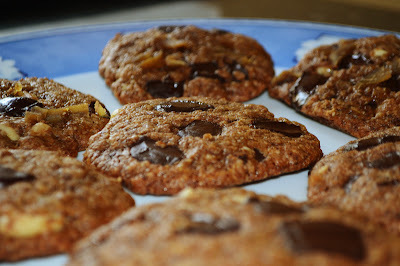 These arent terribly fotogenic , but I promise they are delicious! 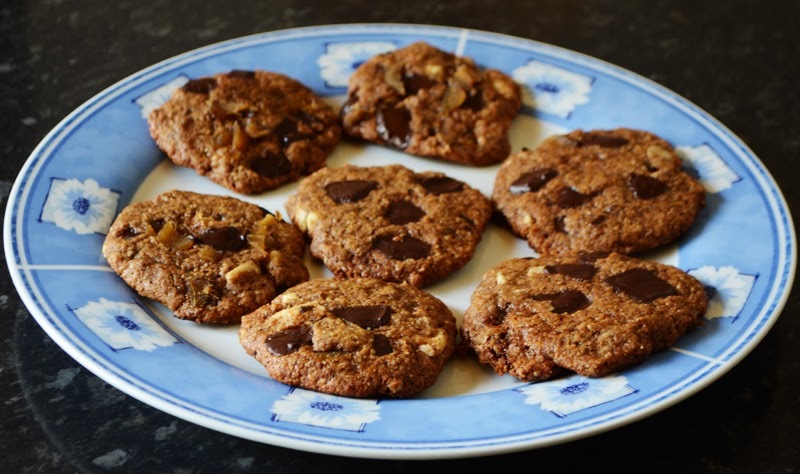 It is a brilliant recipe, but I changed a few things, again to adapt them to what ingredients I had available, and also to experiment a bit. 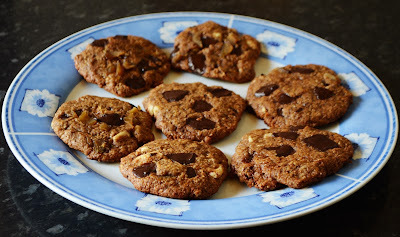 Mine use less flour and less butter, instead I add some ground almonds which make a the whole thing a bit more christmassy and a little healthier. And since I cannot find molasses in Spain I substituted for honey, and since honey is sweeter I used less sugar. 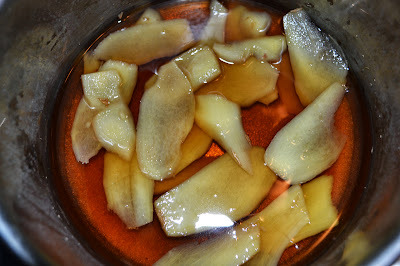 Also, I made my own candied ginger instead of buying it, and I will also explain how. Peel the ginger and slice it into thin slices. 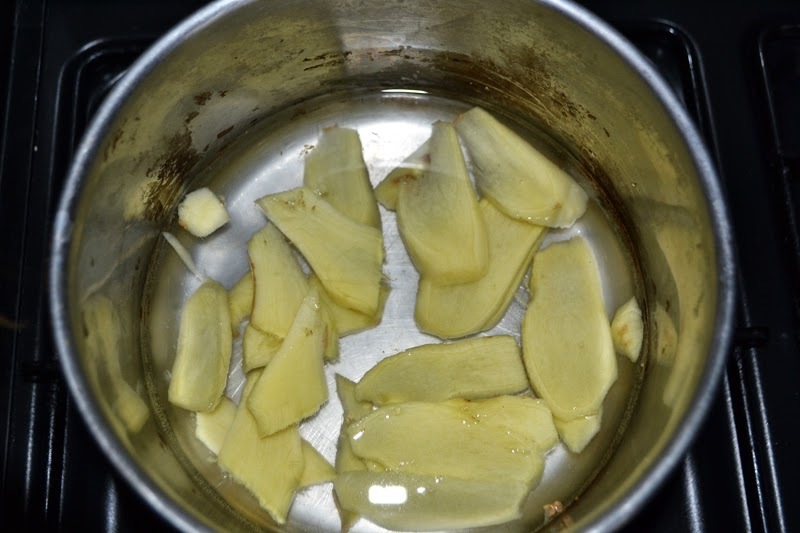 Put it in a saucepan covered in water and bring to the boil. Turn down the heat and let simmer for 10 minutes. Drain (you don´t have to, but here is a lovely ginger tea if you want it! And if you hapen to have a sore throat, you really should drink it! ) and, with new water, simmer again for about 3 minutes. Then, drain again and place in the saucepan with the water and sugar. Let come to the boil, cover, boil on high heat for about 1 more minute, and take from the heat. Let stand for about an hour (or overnight) . Take the gingerslices out and use the infused syrup for swetening tea (as I have done) or lemonade I imagine would also be nice. 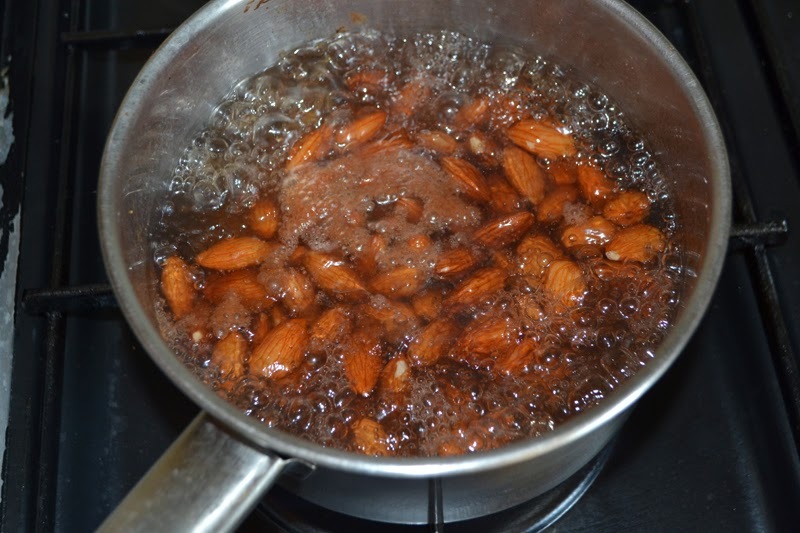 Bring some water to the boil and add about a cup of almonds to it and let boil for 1 minute. Drain them andlet some cold water run over them. 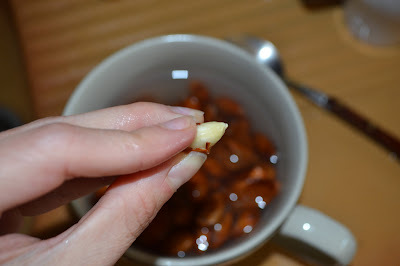 Then you will be able to easily peel them, you press on the peel and the nice and shiny almond will pop out. Meanwhile, get on with the dough. 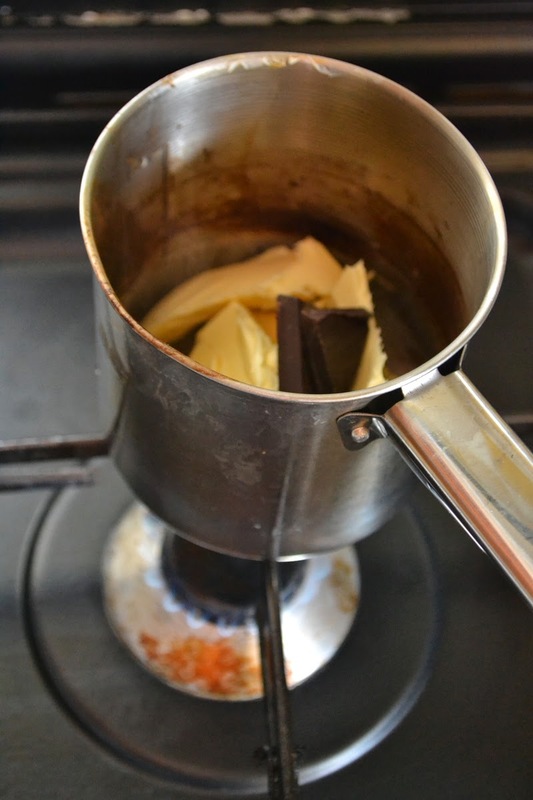 Melt the butter with a little piece of the chocolate in a small saucepan or in the microwave in a cup. Now comes the tricky bit, or maybe not at all, depending on what equipment you have. 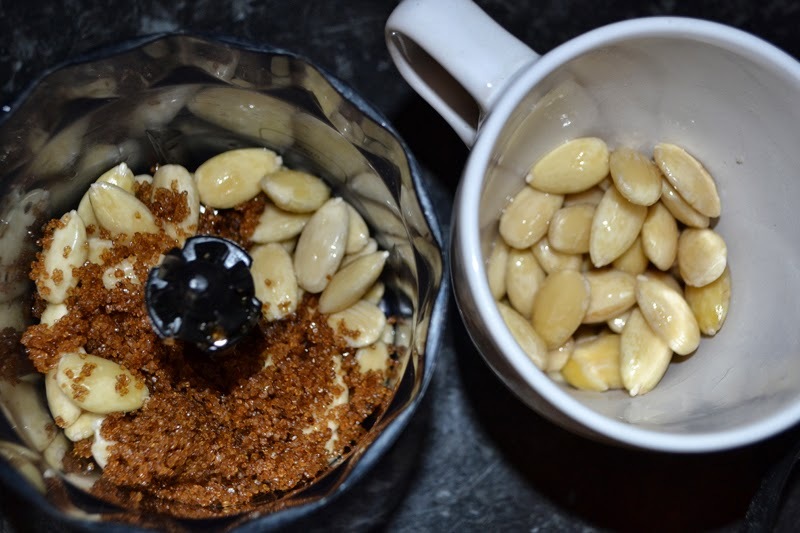 You have to grind the almonds. It can be done in a blender, with a miniprimer or handblender or magic wand (seriously, that is how they call them in Germany) or otherwise with a coffebeangrinder or if none of these are available a roundish stone and some patience will do. it does work, I have tried it. It helps to add the melted butter to the blender with the almonds, and some of the sugar. Now mix together the dry ingredients: All the flour, the sugar you havent already put in the blender, the ground ginger, the cinnamon, the salt, the pepper, the baking soda. 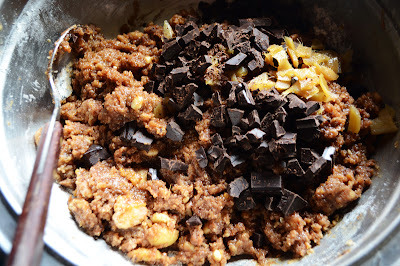 Add the almond - butter - chocolate mixture, the egg and mix well. Then add the chopped chocolate and the chopped ginger. Go ahead and preheat the oven already, to 180 C or about 5 gas mark. On a baking tray, put some parchment paper, that will make it easier to grab the cookies afterwards. 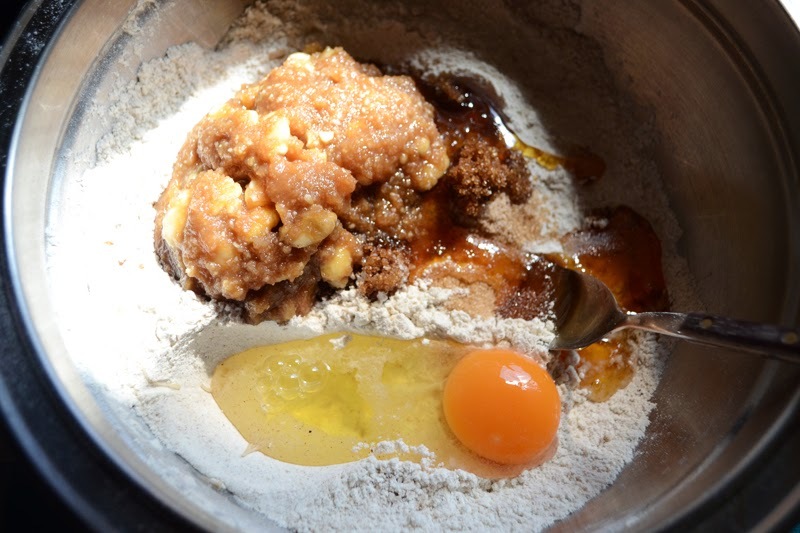 With a spoon and your hands, form little cookie shaped moulds on the parchment. Bake in the oven for something between 12 and 18 minutes. Dont worry if the cookies still seem too soft, they will get firmer when they cool. 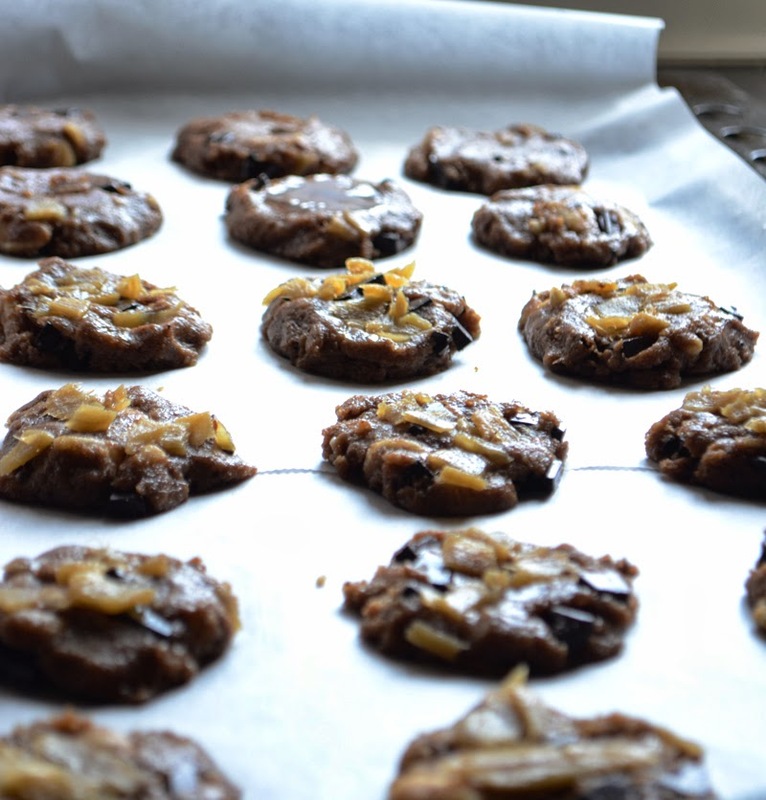 Take out of the oven and let cool before handling, storing or devouring. Store in a closed container. Those look really delicious, Sofia. And love that our made your own ginger. I'm so glad your worked out the recipe for yourself. I'm going to have to try them! Thanks so much for the link back to my blog. Cheers!